Hey, crafty friends! I hope you’ve had a great week. Mine was fine for the most part. I somehow jacked up my hip when I went for a jog last Saturday and had a bit of trouble walking most of the week. But yesterday afternoon I saw my wonderful massage therapist, and she fixed it, because she’s awesome. So I’m feeling pretty good now! Okay. The card. I had soooo much fun making this card! Our colors for the Dynamic Duos challenge this week are Real Red & Island Indigo. Two of my favorites. I’ve probably said this before, but I’d marry Island Indigo if I weren’t already taken. I decided I wanted to do a festive birthday card, and I hadn’t used Cycle Celebration in forever, so I grabbed it. I embossed the top two-thirds of the white panel using the Decorative Dots folder (I left the bottom third flat for the “celebrate” spinner track). (The Decorative Dots folder is a free Sale-A-Bration item, which you can earn by spending $50 in my Stampin’ Up! store now through March 31!) I stamped the candle from Cycle Celebration three times in Island Indigo, then fussy-cut them. Then I stamped the candle flame onto the Silver Glimmer paper and fussy-cut the flames out and glued those to the candles, then glued the candles to the white panel using Tombow Multi-purpose Liquid Glue. I intended to use the Cycle Celebration bicycle for the spinner, but as the card shaped up, I changed my mind. I had the Starburst framelits out on my desk, and the smallest one was the perfect size for a spinner base. Then I added the star from Perfect Pennants (stamped in Real Red and fussy-cut) and die cut the silver foil star using one of the accent thinlits from the Circle Card thinlits dies. I actually added the arrow from the Peachy Keen stamp set after I’d already assembled the other layers of the spinner. My eye landed on the arrow’s matching die from the On Film framelits, and I decided that arrow needed to be on my spinner. So I *finally* added my pennies and Dimensionals and was happy with my finished spinner. [I learned to make a spinner card via this tutorial. They’re so much fun! You should try one. Only use the Word Window punch to make your track instead of cutting between circle punches. Much easier.] The sentiment on the spinner track is from the Express Yourself hostess set, and the tiny stars above the spinner track are from the Banner Blast stamp set (also a free Sale-A-Bration set). I cut the top edge of the red panel and the Silver Foil panel using one of the Adorning Accents edgelits dies. Love these dies, use them for everything. I also embossed the silver panel with the Chevron folder. I made the tag using the Scalloped Tag Topper punch. I layered some Real Red over the Island Indigo cardstock, angled the Real Red and trimmed off the excess, and ran both layers together through the Big Shot with the Decorative Dots folder. I cut the starburst for the tag with the Starburst framelits out of Silver Glimmer paper. 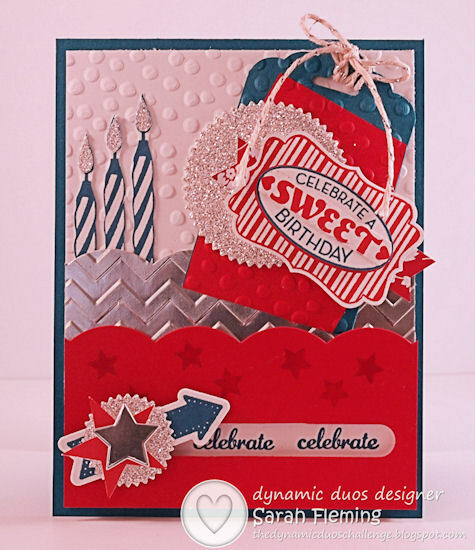 The sentiment tag is one stamp from Cycle Celebration. I stamped it three times — twice in red and once in indigo. I punched the full tag out with the Decorative Label punch, then punched the blue oval out using the Large Oval punch. Then I fussy-cut the “SWEET” and glued that on top of the indigo oval. Then I attached the oval to the decorative label with Dimensionals. The patterned paper on the flags behind the decorative label is from the Fresh Prints designer series paper stack — love this stack of paper! After I attached the SWEET tag to the big tag with dimensionals, I wrapped a bunch of Silver Baker’s Twine through the slot on the tag, then tied it in a bow. When I showed my MIL the card last night, she mentioned that it would be a perfect “sweet 16” card. I agree! You could either replace the candles with a stamped “16” or a die-cut “16”, or you could keep the candles and put the “16” overlapping the bottom left corner of the scalloped tag. I hope you like the card. It’s probably one of my favorites. 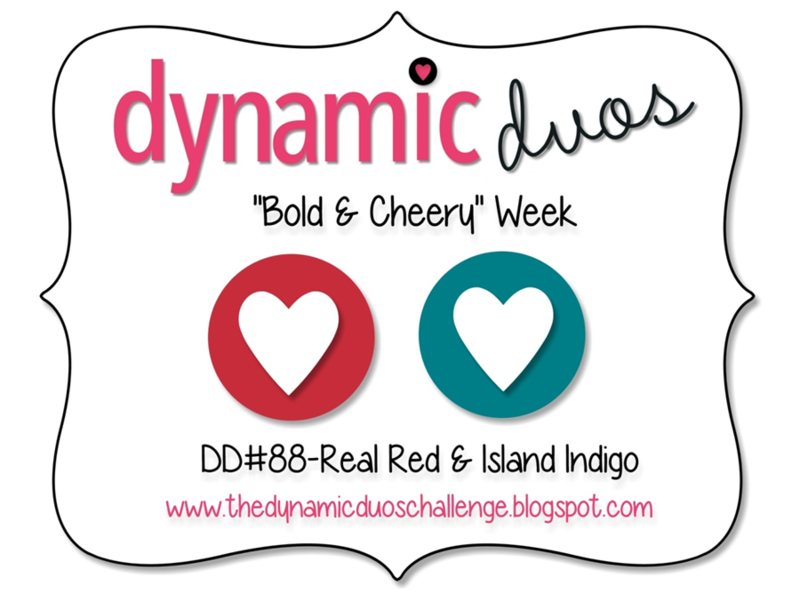 :) We’d love to have you join the fun at Dynamic Duos. Show us what you’ve got! You can buy most of the products I used for my card in my online Stampin’ Up! store. And you can earn the Banner Blast stamp set or the Decorative Dots folder, now through March 31 when you spend $50 (before tax and shipping). Spend $100, and you can earn both! See all the Sale-A-Bration products you can earn for free here. And if you’ve ever considered becoming a Stampin’ Up! demonstrator, now is the perfect time! For your $99 joining fee, you receive your choice of $150 in free product (with free shipping) AND if you’re joining for the first time, you can attend Stampin’ Up!’s awesome Convention for FREE this year! They’ve never offered this before!! I went to Convention last year, and it was a BLAST. Check out this link to see all the benefits you receive as a Stampin’ Up! demo and sign up to join my team. I would love to have you! Wow Sarah, this is fabulous. Love the layered tag, embossed background and your spinner element. Wow! Sarah! This is gorgeous! There are so many fun elements going on here! Love the glitter accents. Really pops! Super shiny and festive! All of your glittery elements are wonderful. So inspiring!